To be rebellious against the salt tax imposed by the British on Indians, and also to create a widespread awareness in the minds of public, Mahatma Gandhi had followed the Salt Satyagraha which was profoundly called as the Dandi march on March 12, 1930. In relation to this, the Gandhi World foundation celebrates it as the awareness day every year. To spread the message among the masses we conduct various awareness programs this day. This year we had joyously celebrated “the plastic avoiding awareness day” on March 12, 2013. 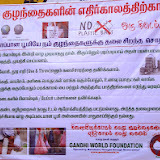 The motto behind this movement was that the people should know what the causes behind usage of plastics are.